Do you have a great business idea and want to start up your own company? Do you know the possibilities you have to finance a start-up in the technology sector? We will introduce different financing possibilities to you with their respective up and downsides. In general there are two different approaches to finance your business. The first is to grow your business organically. This means you spend only your own money and invest only the profits you earn. This way is possible for Consultancies or Service Businesses, where you don’t need a big amount of money in the beginning. The second approach, which you might need for most of the technology based companies. This is because you need a very high starting capital, so you need external financial help. An example would be a Software-Company, which does not create any earnings as long as they are in the developing stage, but they already have expenses at this period. In the following we introduce four possibilities to bring cash into your business. This model brings you free money, literally. Cash will be provided with no need to repay and no reduction of the ownership. You only have to respect the terms and conditions. Awards and grants are limited by the WTO, EU and other local trade organizations to maintain a fair competitive landscape. Governments are only allowed to assist in order to create employment and to help develop new technologies and processes. Awards or grants are only a contribution to your funding, additional money is still required. Advantages of this method are that there is no repayment, only little interference in running the business. The rules and criteria are always published, including advices, and the process of applying is straight forward. The disadvantages are that you might have to repay your received money if your business direction changes. An example would be that you might be forced to use the result of work out of Europe, but the stipulation of the award or grant said you are only allowed to use it in Europe. The application process is time consuming, it can take months to years and might require money for the time while waiting. This financial model suits businesses of all sizes. You sell equity to an external investor, which means you sell a share of the profits you generate. You use the money which was invested to grow your business. The investment does not have to be repaid. The investor hopes for the ROI, the return on investment. This implies if the company fails, the investor loses his money. A Business Angel is a businessman with money and expertise, who wants to get involved in start-ups or small companies. Business Angels invest between 5.000 and 250.000$. Additionally to the money Business Angels bring in their precious expertise. If you need more money than Business Angels provide, you should go for a Venture Capital organization. They invest Venture capital up to 25 million $ in businesses with a high growth potential to grow them and sell it later with big profits. Floatation is to offer your equity to the public and your shares freely on the stock market. Advantages of this method are that you don’t have to repay capital and no interests have to be paid. Additionally expertise, experience and contacts will be provided by the investor. But this leads to the disadvantages like the reduction of ownership of your company, loss of flexibility due to lost control and legal fees. The chart below shows the different possibilities we heard so far and you can see how high their investments can be. To the right the costs of the investment and the due dilligence, the appropriate carefulness you have to apply, increase. This financing model can have different forms like loaning money from financial institutions or any other person or overdrafts. Debts have to be repaid with interests. That is why, in order to get it, you might require guarantees for debts. Some states offer loan guarantee schemes to small companies. If the company fails, loans have to be repaid before shareholders receive any money. Advantages of this method are the little or no interference in your day to day business by investors. You don’t share your business equity and this form of funding is relatively cheap. The big disadvantages are that the lender can prevent you from going to other lenders or from using other funding models to strengthen their own position. Additionally the lenders biggest interest is his own capital, which means he could demand his money back if the risk of losing it seems too big. Crowdfunding is a method of raising capital in small amounts from a large group of people using the internet and social media. There are three different ways of crowdfunding. The first one is called ‘Donation/Reward crowdfunding’. People invest just because they believe in the idea and have a social media or personal motivation. Additionally rewards can be offered. The second is called ‘Debt crowdfunding’, a peer-to-peer model. Investors receive their money with interests, but have also the benefit of having contributed to the success of an idea they believe in. ‘Equity crowdfunding’ is the last one. People invest in exchange for equity. Money is exchanged for a small stake in the business. Its value can go up and down. What you always should do first is to check if there are grants available for your Business Model. Because grants are free. 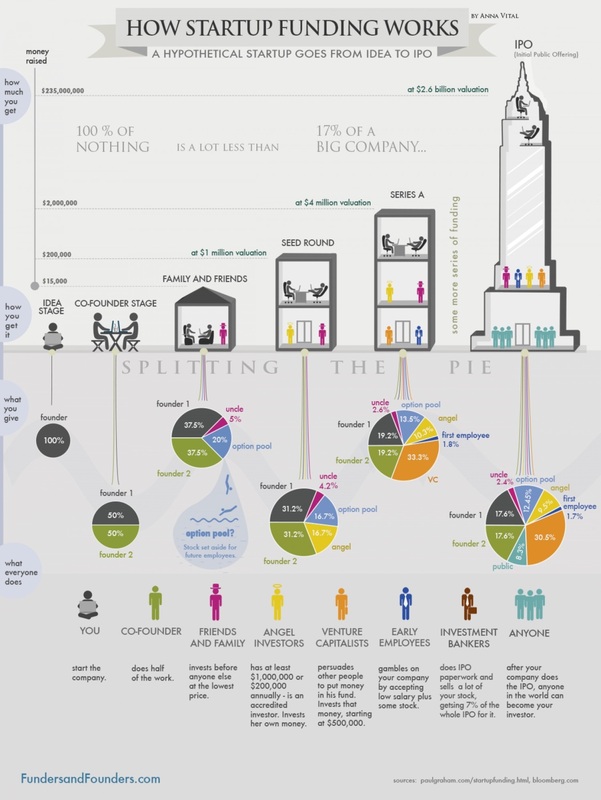 After that you should check how much money you still need to decide which funding option fits your business model. As soon as you know, look at the top graphic to check out your possibilities. Choose Crowdfunding if you don’t need any expertise of people like Business Angels and if it is no problem to make your Business Idea public. In this video the different stages of Venture Capital investments are explained more detailed and with examples of companies and where they are right now. The following two videos show examples of crowdfunding campaigns. The goal of the first crowdfunding campaign is to finance a mission to Mars. The second campaign is about financing a technology that waters crops of poor people with sunlight.